Robert Sinskey's Vin Gris has a cult following. Only very small quantities are made each vintage and the wine is among the very few allocated rosés. I understand the state of Alabama gets only a few cases, a few bottles of which landed in my local wine store, The Wine Seller. Bravo. I used to sell Robert's wines in New York. This is a wine I could sell without ever sampling a bottle, but by sending out an email to twenty of my top buyers. I would write orders totaling a hundred cases in a single morning. It's the best kind of sale. I once took some of those buyers out to Napa and Sonoma for a long weekend and our visit to Robert's place was a favorite for us all. His wife, Chef Maria Sinskey, made a wonderful lunch after our tour and tasting. Vin Gris is another name for rosé wine. Made from 100% organically grown pinot noir grapes in Northern California, Robert Sinskey's Vin Gris is elegant yet easy, versatile yet distinguished, complex yet comforting. 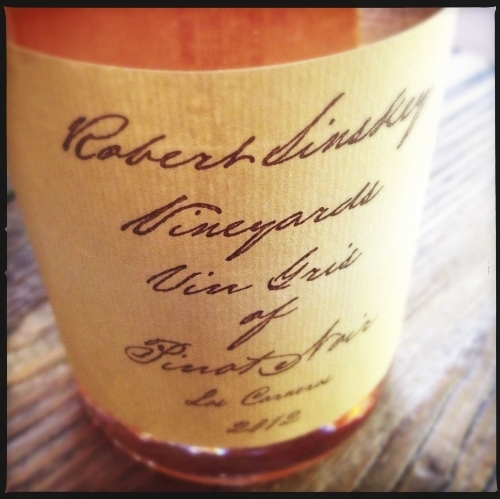 Robert Sinskey Vin Gris of Pinot Noir 2012 exhibits strawberry and floral notes, followed by strawberry and melon on the palates. Incredibly acidity and balance, infinite finish. Every bottle is a special occasion, yet it goes with everything. Read more about this wine from Robert Sinskey himself (especially the POV) here. He's a bit of a renegade with a great deal of conviction. We love conviction.